I exclusively use stop limit orders to enter day trades. This is because I trade breakout strategies and I like to wait for the price to exceed the most recent high or low. 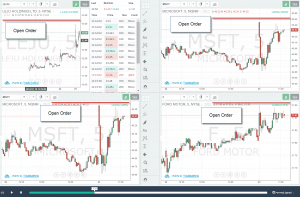 In this article, I will cover the 5 Reasons stop limit orders have helped improve my trading. Before we get into the fun, let me first ground you on the concept of stop limit orders. A stop limit order is an instruction you send your broker to place an order above or below the current market price. The order contains two inputs: (1) activation - the price where the limit order is activated and (2) price - which is the limit price where the order will be executed. To further illustrate this, let's take a look at a few real-world examples. In the above example, I am entering a buy stop limit order for the stock RHI. In this example, RHI is currently bidding at $52.04 with an ask of $52.14. Let's say that I have my eyes on entering the trade, but not until RHI hits $53. Once $53 is achieved, my limit order of $53.10 is activated. You may be asking yourself, why not just enter a limit order to buy at $53, what's the point of the activation price? If you were to enter the limit order by itself, the order would execute the minute you enter the trade. Reason being, RHI is trading below $53 dollars, so the order would execute because you are entering the trade at a lower price than $53. A sell stop limit order is an order to activate a short position at a lower price. In the above example, the order instructions are too short TEL once the stock price breaks $61 with a limit price at $61.87. 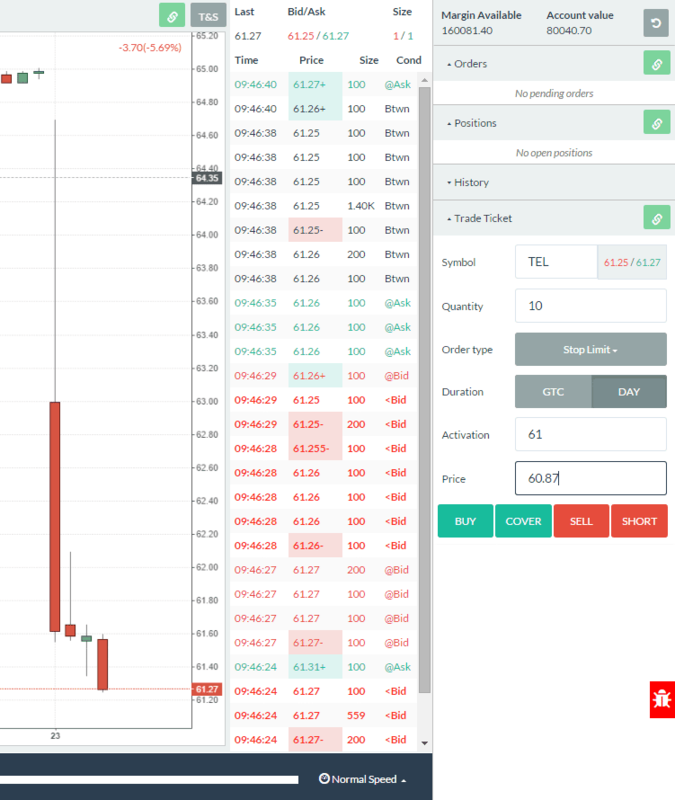 Again, as mentioned in the previous example, if you simply place a limit order to sell the stock short at $61, the order would execute as the stock is bidding at $61.25. Now that we have covered the basics of the order type, let's explore the 5 reasons I use stop limit orders to enter my trades. As I stated at the beginning of the article, I only trade breakouts. Anyone that trades breakouts knows the hardest thing to do at times is to actually let the price approach and exceed the swing high or low of the day. As a day trader, you are literally there watching the price action and if you stare long enough the market will catch you in its grips. What I mean by this is you will have a price you are looking to enter the trade; however, you feel the breakout is a sure bet. Therefore, instead of letting the price action play out, you jump in front of the trade hoping to get a better entry. 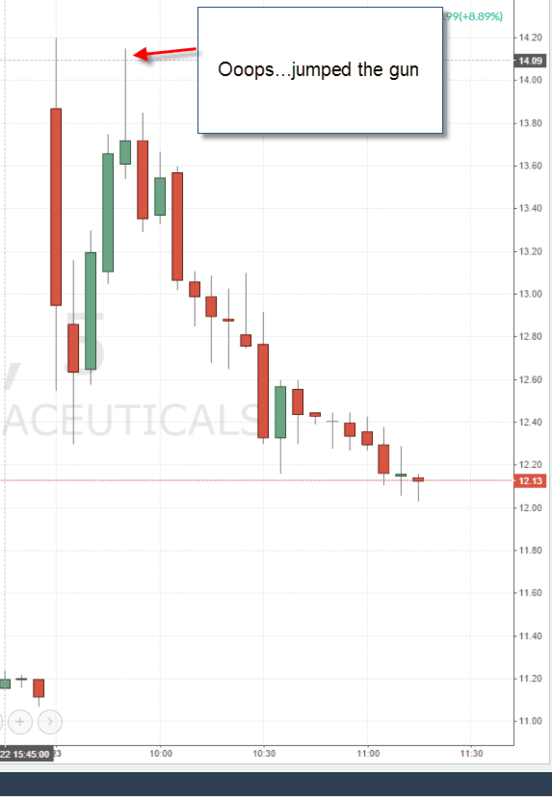 What happens next is the stock will never breakout and will begin to reverse. Now you are in a losing trade that you never should have taken, but you need to jump out front will end up costing you in the end. Even worse, you could end up winning in the trade. 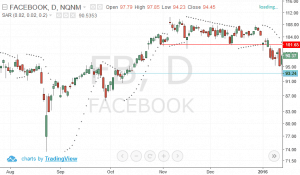 Now, the bad habit has set in and you start to think you can gauge when a stock will breakout prior to the price action. As you can imagine, we all know how this will play out over the long run. The market will present prices to you that sometimes seem a bit strange. What I mean by strange is that some stocks will have large price spreads. If you are looking to enter the trade through a market order, you could find yourself instantly down on the position. If you wanted to buy LEJU at market in the above example, you would enter the trade at $13.60. 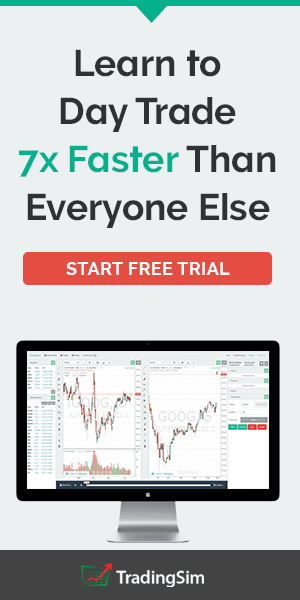 This would immediately put you at an almost 1% loss on the trade. What should you do at this point if you are trying to scalp or make a quick .5%? 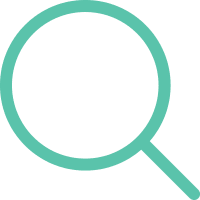 In addition to minimizing your spread, you can also get better pricing if a seller is willing to lower their ask and meet you somewhere in the middle. You are going to find large price spreads in stocks with high volatility. Entering a buy or sell stop limit order has always done me well by allowing me to take control of the trade from the start. 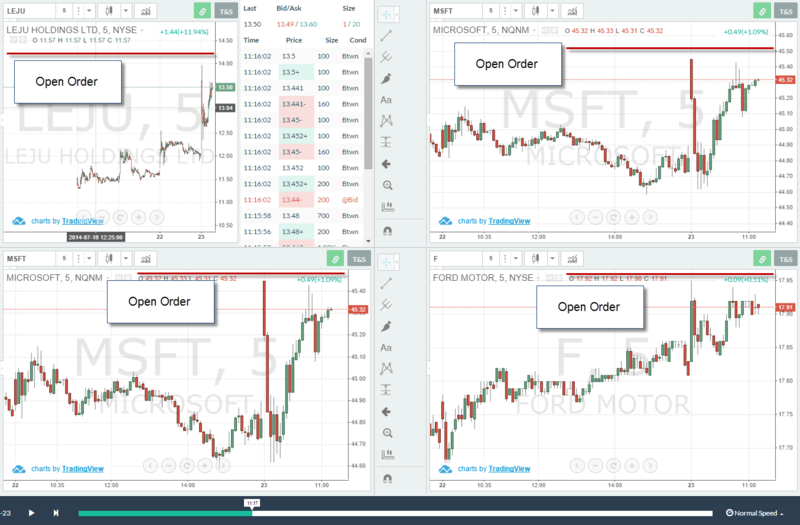 If you enter trades through market orders and are tracking multiple stocks, you will need to have your finger on the trigger. In day trading, you will notice that the market is bombarding you with a number of trade opportunities. Even if you are able to dwindle that list down to a more manageable number, you will still have 5 or more trades you could open. After I have watched the stock's trading activity for the first 20 to 30 minutes, I will have a good feeling for how it's performing. Once the setup is clear, I will enter my stop limit order and then focus on new setups as they arise. This allows me too essentially expand my pool of potential trades. The downside to fire and forget is that you can't completely take your eye off the ball. If you have 5 open buy orders and the market shoots up suddenly, your orders could all fill simultaneously. In a flash, you could be overextended and exposed to too much risk. The way I reduce the risk of this occurring is by having the audio option activated, so once an order fills, I hear that the transaction was completed successfully. This way I can quickly cancel any pending orders to ensure I don't get in over my head. At times, we all may experience a bout of over trading. This is where you are taking on too many positions to either fight the market, make quick profits or looking for an expensive thrill. By entering a stop limit order, it keeps me actively engaged with the market. I'm not just thinking in my head of what I should or shouldn't do, I''m actually taking real action. One minute I am entering in an order for a position, only to cancel the order 5 minutes later. This level of engagement keeps me sharp and focused on what's in front of me. When I would have the total freedom of entering market orders, I would find myself sitting there waiting for something to happen and after a while, I would take matters into my own hands. So, staying engaged and putting these teaser orders out in the market is a way for you to test the waters without every truly committing. Trading can feel all over the place at times if you do not adhere to strict rules for how to engage with the market. When you really step back and think about your trades, it all comes down to that first action of opening the position. From there, you may decide to scale in more or scale out. You may decide to adjust your profit targets or to outright take a stop loss. If you tried to actually evaluate the full breadth of options at your discretion, the number of possibilities would be overwhelming. But again, it all comes down to that initial entry. What a stop limit order requires of you is to enter in both the activation price and limit price. This means you have to first think about what level you want the stock to reach before you do anything and then what price you want to enter the position. This may sound like a foregone conclusion, but most people buy or sell based on what they feel. 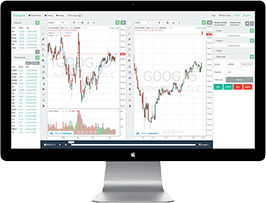 For you to get to a point where you can make trading decisions based on how you feel requires thousands upon thousands of hours of successful trades before you are that attuned with the market. Why am I placing a market order? 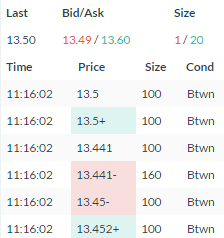 Based on where the stock could run, is the bid/ask price spread tight enough that I am not immediately upside down on the trade? Have I waited until the price is exactly where I want it or am I chasing the trade? For those of you that are hung up on the technical aspects of a stop limit order, you are sadly mistaken. The types of orders you actively use in the market speak volumes about how you perceive risk and your ability to exercise a bit of patience when trading the markets. All of the screenshots taken for this article were created using the Tradingsim market replay platform. To test drive placing stop limit orders, please visit our homepage to learn more about the platform. 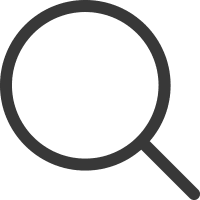 Thank you so much Sir for your reply in your blog “7 Ways to Find the Best Stocks to Day Trade”. Actualy i wanted to thank you there only but i cant find any comment column there. Sir, i have one more question regarding stock trading. Sir, as you are a professional day trader, so the broking firm in which you have opened your trading a/c can’t take advantage of your strategy/skills by looking at your orders status? Hi Prince – thanks for the kind words. I am but a small fish in a big pond….. The SimTrading is amazing. I would like to thank you for this possibilities. 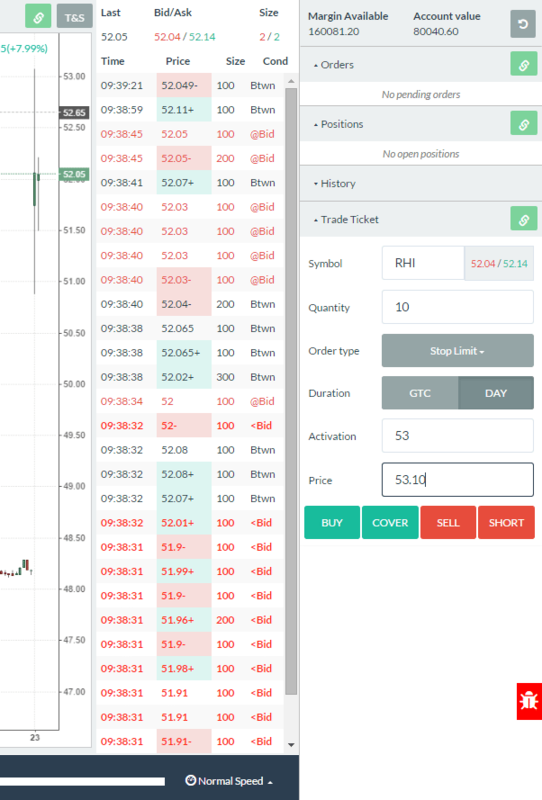 because when I simulated the Stock TradingSim my order are canceled with Buy Stop Limit Order. Like I said this order type take my position even if there are gaps up then I’m in the Stock. In real Financial Market I will be in position.would you please fix this bug. Another thing I would like to have in this Simulator is if you can give us the opportunity to put an Stop Loss. Stop Loss is very important I always use a Stop Loss. something to keep me on the trail. I was wondering why you express your limit price in terms of 10cents above/below the stop. Would using a percentage instead not be optimal?